These crispy roasted potatoes are coated in Ranch seasoning and Parmesan cheese, for an easy and tasty side dish. I can’t believe November is here! 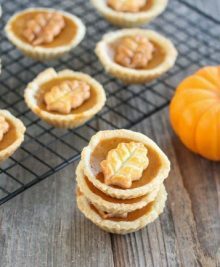 It’s already time to start testing Thanksgiving recipes, gather photos for Christmas cards, etc. The extra hour we gained on Sunday has really thrown me off. Yesterday, I felt like I had all this extra time, which is a good thing, as I felt like I accomplished more than usual. And luckily, that productivity has carried through to today. The only bad thing was that by 6PM I was starving for dinner. 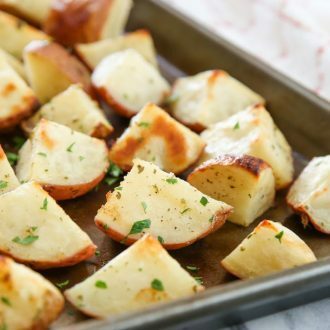 Roasted potatoes are such an easy side dish and you can flavor them however you like, but I have to say these ranch roasted potatoes with Parmesan cheese are one of my favorites. I used a packet of ranch dressing seasoning to make these even easier. No need to buy a bunch of different spices to make your own! 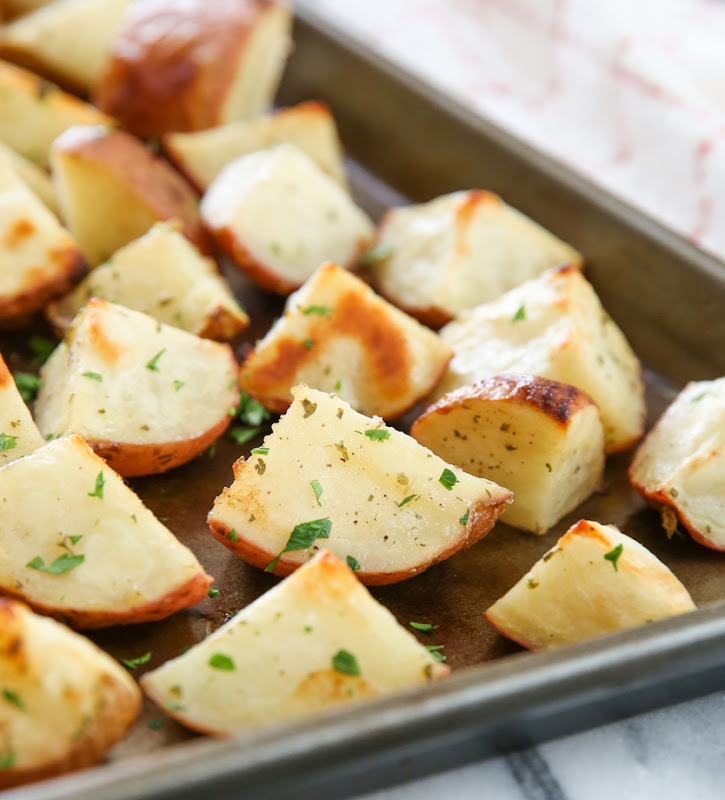 The best way to roast potatoes is in a hot oven. Be sure to preheat your oven ahead of time to 400°F, while you’re waiting for the oven to get hot you can prep the potatoes. I used red potatoes for this recipe. You’ll want to wash your potatoes and dry them well. You don’t want them damp otherwise they’ll steam and won’t be as crispy. You don’t need to peel them, either, because the skin will get crispy in the oven. I cut each potato into quarters. I like them to be the size of about two bites so if your potatoes are larger you may need to cut them into more pieces. 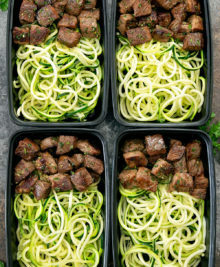 Just be sure the pieces are all the same size so they cook evenly. The easiest way to coat the potatoes with the ranch seasoning and cheese is to use a large Ziploc bag. Add the oil, ranch, and Parmesan cheese to the bag. Add the potatoes, seal the bag, and shake it to coat the potatoes. Spread the potatoes in an even layer on a baking sheet. Roast them for 30 to 35 minutes or until they’re tender and crispy on the outside. 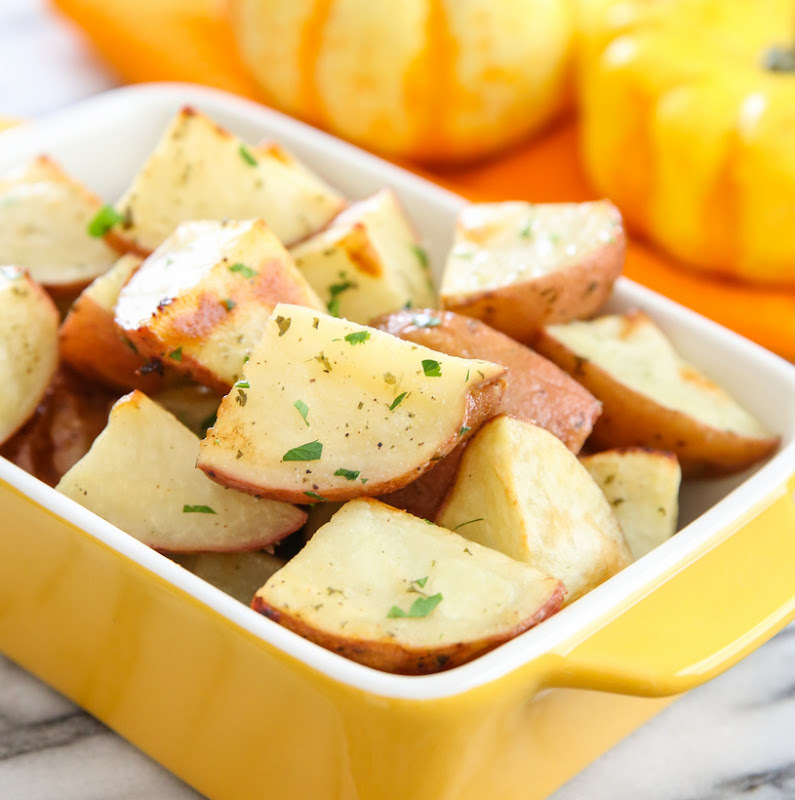 These potatoes are so easy and you can serve them as an easy weeknight side or for holiday meals. 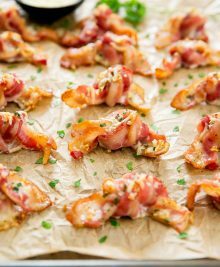 You can even make them for breakfast along with some bacon and eggs! They are so simple, yet so addicting and satisfying. 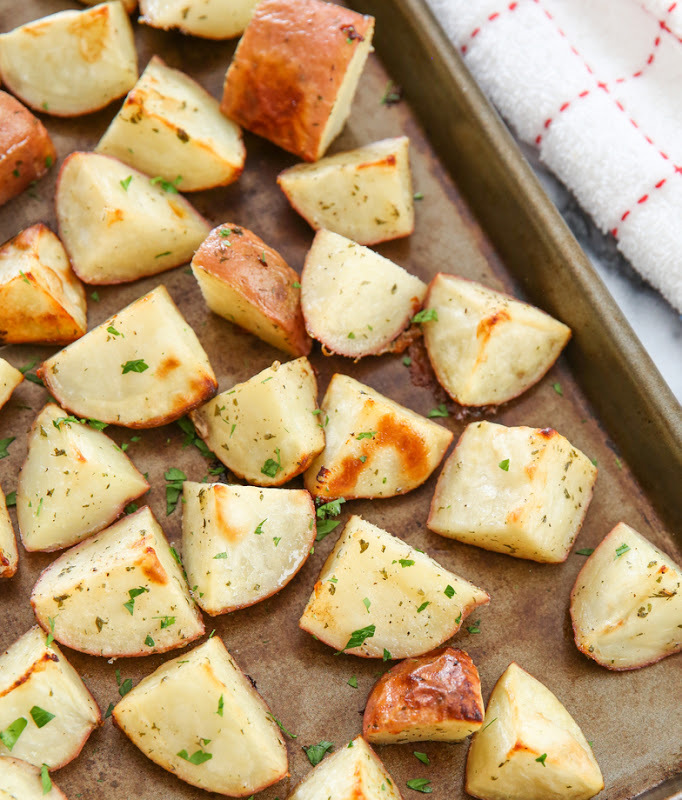 I’ve done crispy potatoes before, but these Parmesan ranch roasted potatoes are definitely my new favorite. These crispy baked potatoes are coated in Ranch and Parmesan cheese seasoning, for an easy and tasty side dish. Wash your potatoes and then cut into quarters. If your potatoes are larger, you can divide them down further. Each potato piece should be about two bites. In a gallon sized then bag, add oil, seasoning and cheese. Then add in potatoes. Seal bag and then shake to toss and coat potatoes in seasoning and oil. Place fully coated potatoes on baking sheet. Bake for about 30-35 minutes or until potatoes are fully cooked and outside is crispy. Sprinkle chopped parsley on top if desired. I used red potatoes, but you can choose whatever variety you'd like. I grated the cheese and put it through a food processor to break it down to crumbs.